hydraulic and brake fluid to snack foods? The answer is: it does and it doesn't. It is a toxin regardless of which strength is used. Propylene Glycol is a form of mineral oil, an alcohol produced by fermentation of yeast and carbohydrates. This gives it the designation of carbohydrate when used in foods. Because it comes in several grades, PG has been used for a variety of uses. Industrial grade PG is used as an active ingredient in engine coolants and antifreeze; airplane de-icers; polyurethane cushions; paints, enamels and varnishes; and in many products as a solvent or surfactant. In all fairness, it should be stated that PG was only added to anti-freeze to replace Ethylene Glycol. It had been a problem because dogs often lap up puddles of anti-freeze. The form most pertinent to this article is the pharmaceutical grade. This is a much less concentrated form of PG and therefore less problematic. That being stated, it is also the controversial form due to its use in products that are either ingested or enter the body through application to the skin. It is commonly used as a solvent in oral, topical and injectable drug products as well as in foods. Though the controversy over PG wages on, it is not for lack of research. In fact many studies have been conducted, but results have been contradictory. Possibly this is because the concentration of PG in the formulation studied is not always readily apparent. Regardless, the government agencies involved have deemed it safe: The FDA includes Pharmaceutical grade PG on its Generally Recognized As Safe (GRAS) list. The World Health Organization also considers it as safe for use. Studies on dogs and rats, which were fed doses of PG ranging from two to five grams per kg of body weight per day, showed no links to cancer. The results satisfied the Cosmetic Ingredient Review Expert Panel enough to conclude that there was no carcinogenic risk with low levels of ingestion of PG. A low level of PG was defined, and as a result, the panel recommended that only PG with a concentration less than 50% should be used in cosmetics. Though cancer might not be a concern, it was also found that PG provoked allergic reactions in patients with eczema and other skin allergies, even in formulations of much less than 50%. The Material Safety Data Sheet (MSDS) cites skin, liver and kidney damage that can result from contact with PG, and it gives safe handling instructions, calling it a hazardous substance. Though not specified, this is for the more concentrated industrial grade. mutation. Other research conducted twenty and thirty years ago documented toxic effects after repeated small doses of propylene glycol were ingested or repeatedly applied to the skin. Acute toxicity was found to follow I.V. injection of drugs dissolved in significant amounts of PG. 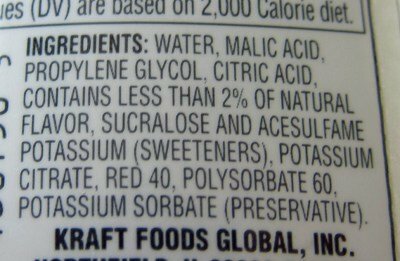 In Europe, where the authorities are much more cautious about what is allowable in cosmetics and foods, propylene glycol is limited to mostly non-food uses. What food uses are allowed are very limited. Guys at work go nuts over this stuff. Antifreeze must taste good. Natural News can be a bit flakey soundy at times. It is very good! A quick squirt in a bottle of water! Kramer wrote: It is very good! A quick squirt in a bottle of water! And I bet it doesn't freeze. Riskynet wrote: And I bet it doesn't freeze. It's flavouring for water. How hard is that to understand?